Holiday newsletters bring your relatives and friends up to date about the year’s events, but designing, printing, and mailing them can be a chore. This season, save money and time by replacing a traditional newsletter with a Website created in iWeb '09. Here's how. Catch up with yourself. Photos will be a big part of your site (naturally), and reviewing your iPhoto library can help you get organized and remember events worth sharing. In iPhoto, select File -> New Smart Album and create an album of the year’s pictures. The Smart Album dialog contains three pull-down menus that give you contextual choices. For example, I chose Date, Is in the range, and then filled in the dates I wanted. There are lots of other parameters to choose from that will let you narrow down your photo choices. Check out the contents of the smart folder, choose the pictures you want to use for your newsletter, place them in a separate folder, and name it something like “Newsletter pictures”. Note that you can create as many albums as you want—say, to showcase your camping trip or a special family visit—or you can just assemble all your favorite photos into one album. Get started with iWeb. Select File -> New Site and pick a theme. 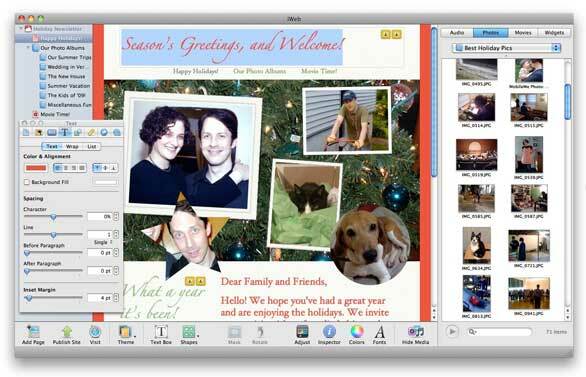 iWeb doesn't offer holiday themes, so Leaf Print or Watercolor may be appropriate choices, or maybe just choose a plain Black or White theme that gives you a neutral canvas on which to create your own holiday spirit. Select a My Albums page to begin. To add pictures, select View -> Show Media (or click the Show Media button at the bottom of the window) to show iWeb’s Media Browser. Then drag your iPhoto albums into the album template. New Photo gallery pages immediately open to show you each image, and there you can edit captions and other placeholder text. To allow visitors to download photos at full quality (or leave comments, if you host with MobileMe), select your photo page in iWeb’s left sidebar, then select View -> Show Inspector. Choose the Photos inspector, which gives you several options for controlling how your photos can be downloaded or not, and also lets you edit the page’s slideshow settings. If your site is hosted with MobileMe, the Photos inspector has settings that let you allow friends and family to comment on your pictures. To reuse a gallery from another iWebsite you've created, select the original page in the sidebar, then choose Edit -> Duplicate. In the sidebar, drag and drop the duplicated page into your newsletter’s My Albums page. You’ll likely want to rename the page and change its theme to match your current site. Add videos with MobileMe. A MobileMe gallery can help make your videos accessible to visitors with a broad range of Internet connection speeds. 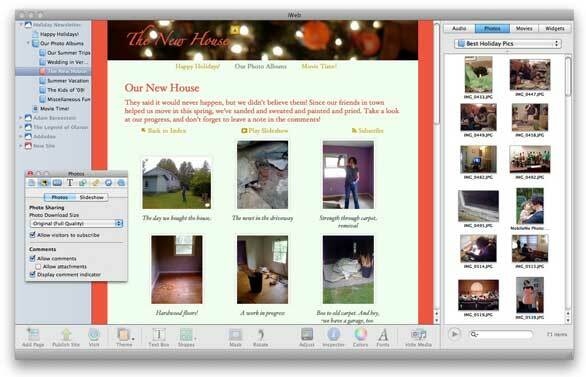 Start in iMovie’s Project Library by choosing a video and selecting Share -> MobileMe Gallery. Export your video at multiple sizes via the resulting dialog. In iWeb, select File -> New Page, and add a Movie page to your site. Delete the page’s placeholder video. Replace it by dragging the Media Browser’s MobileMe Gallery widget onto the page. Drag the widget’s handles to position it in the space left by the deleted placeholder and then choose a video from the widget’s pull down menu, which should include the movie you uploaded. Once uploaded, your movie will be playable from the site page and link to copies of the same file at a variety of sizes. Tailor your site to the season. By now, you probably know what you’d like to say in your holiday message. Add a Welcome or About Me page to your site and edit its placeholder text to suit your greeting. Use iWeb’s Text, Graphic, and Page inspectors to change text, objects, and your page’s background colors. For example, to change a background color, open the Inspector, choose the Page inspector, then click the Layout button. Select Color Fill for both the Page and the Browser backgrounds and click the swatch below each option to pick new colors. Note that the Text inspector lets you make similar changes to headlines and other text on your pages. Alternately, you can use your theme's blank page as an empty canvas on which to place a large holiday-themed photo and superimpose headline lettering on it. iWeb lacks holiday-specific themes, but the Inspector lets you make a theme’s colors and typeface more appropriate. Photos from past holidays in festive shapes make great decorations for your page. To add one, select Insert -> Shape and choose a shape you like. Fine-tune its size by dragging its handles, then drag a picture into the shape from the Media Browser. Note the small window that appears near your picture. Drag its slider to change the image’s magnification. Click Edit Mask, and then drag the image to adjust the picture’s position within the shape. Click Edit Mask again and position the shape on your page. You can even use the Rotate tool in the Metrics inspector to tilt your images to a pleasing angle. Not all of iWeb's built-in graphics can be deleted from a page, and some of these images may not be holiday-appropriate. The context-sensitive commands under the Arrange menu can help your custom shapes and photos to mask these stubborn images. To conceal a theme’s built-in image with your holiday photo for example, select your picture, then choose Arrange -> Bring to Front. Position the picture over the iWeb graphic you want to hide and resize if necessary. Newsletter Websites built with iWeb '09 are easy to create, fun to share, and easily updatable all year round.